This is one of the qualities I suspect each of us admires about Martha: her unquenchable desire to learn. 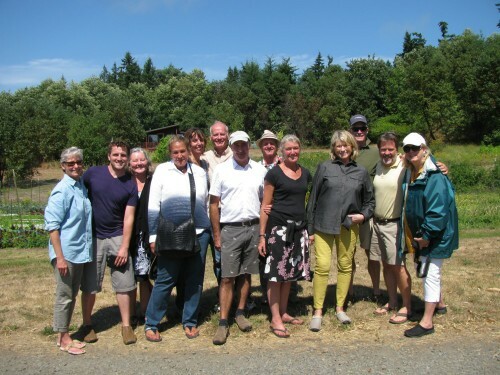 While visiting Washington for the wedding of horticulturalist Dan Hinkley and Robert Jones, Martha found time to visit nearby Persephone Farm. Dan Hinkley and Robert Jones founded Heronswood, a mutli-acre botanical garden in Kingston, WA. You can tour the gardens by visiting the Heronswood website’s photo gallery here. And yes–that is Ryan, Martha’s (very cute) gardener, in the photo, second from left. Martha knew the names of all the plants and we had fun comparing gardens, hers stretching from Bedford NY to Mt. Desert Island, ME. One of her personal gardeners was with us and he seemed to be taking lots of notes and shooting pictures.